This casual reclining sectional sofa will make a terrific addition to your living room or den where you can gather with friends or family. Luxurious leather/vinyl match combines with high-resiliency padding for an aesthetically pleasing and cozy seat. Bustle back cushions provide excellent lumbar support, and arched pillow arms offer a soft place to rest against. With its curved shape this sectional can create a cozy environment where you can relax and enjoy time with others. 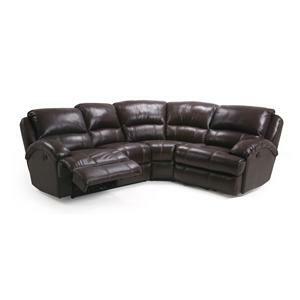 This casual power reclining sofa will make a terrific addition to your living room or den. 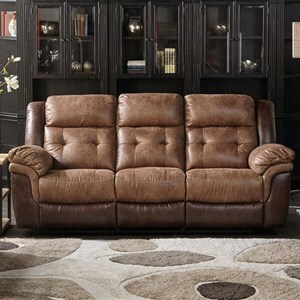 Luxurious leather/vinyl match combines with high-resiliency padding for an aesthetically pleasing and cozy seat. Bustle back cushions provide excellent lumbar support, and arched pillow arms offer a soft place to rest against. Both outside seats recline, allowing you to relax at the perfect angle. Relax with this cozy sectional sofa. Generously upholstered from head-to-toe, this sofa features plump bustle back cushions, oversized pillow arms, and plush pad-over-chaise seats. It also includes two consoles with storage space and cup holders. With the addition of an easy-to-use power reclining mechanism on each side, you will be sure to enjoy the ultimate relaxation while lounging on this sofa. 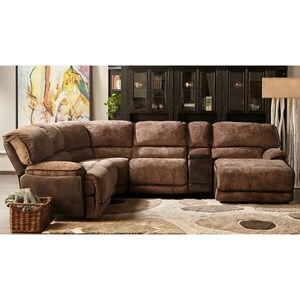 With room enough for at least five people, this reclining sofa is perfect for hosting parties and movie nights. 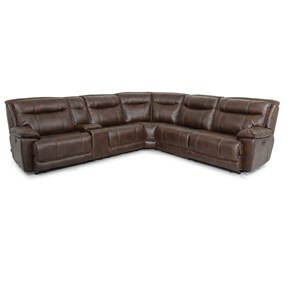 This power sectional sofa creates a comfortable place to relax in your home. Contrasting welt cord trim makes a bold statement while the pad-over-chaise seats provide head to toe comfort. Stretch out on the long chaise seat as you sit back to enjoy a movie or television, using the electric console with cupholders to store your drinks and snacks. Create a living space where you can hang out comfortably with friends and family with this power reclining sectional sofa. 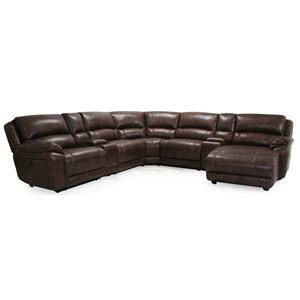 For group seating the whole family will enjoy, try this 6-piece reclining sectional. Pad-over-chaise seats and lumbar supportive backs create a cozy and comfortable place to lounge for multiple people, while pillow top arms and contrast stitching complete the casual look and feel of this sofa. In addition, an upholstered storage console with cupholders makes it easy to work and snack while in the comfort of your own living room. Finally, a lengthy incliner chaise on one ends lets you truly kick back with your feet up. 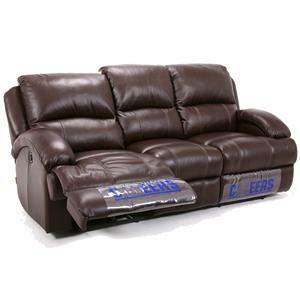 Come home and relax with this plush power reclining sofa. Tufted backs, padded pillow arms, and pad-over-chaise seats give the sofa an overstuffed look that beckons you to sit down. Two power reclining seats and power-operated headrests give you infinite possibilities for your perfect body position. This casual reclining sofa with pillow top arms and top stitching is a great piece to update your living room or family room. With recliners on either end, comfortably seat three people with this sofa. Lumbar support and the padded arms make for a comfortable sit. 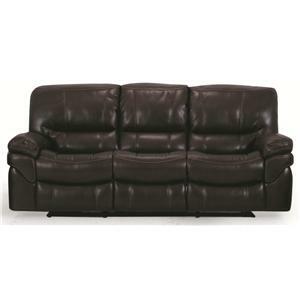 Create a welcoming space for yourself, friends or family with this casual reclining sofa. 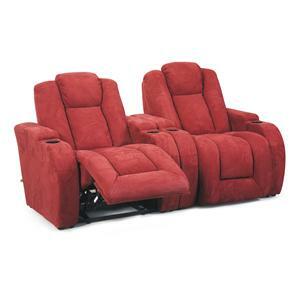 Perfect for movie nights with family and friends, this 3-person theater seating makes for a relaxing night in. Upholstered with top-grain aniline leather over plump bustle back cushions, pillow arms, and pad-over-chaise seats, this seating offers a look and feel that is soft, supple, and supportive. In addition, two 21-degree consoles complete with storage and cupholders make it easy to lounge with food and drink in hand. 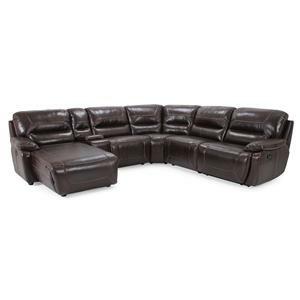 Available in a warm, Chestnut tone, you are sure to feel at home with this theater seating group. 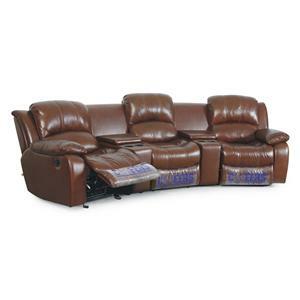 This chaise pad recliner sectional is the ultimate in comfort for your living room or entertainment space. Plush padding on the lumbar supportive back and chaise pad seats will keep you comfortable from head to toe. Track arms each feature a cup holder, and a storage space perfect for stowing magazines, remotes and more. Arm pulls are located on the inside arms so multiple seats can be squeezed together to create home theater sectionals of any size. A power recline option is also available. Create the ultimate space to lounge with family or relax in front of the TV with this reclining sectional. The spacious sectional offers reclining seats that let you kick back and relax. Contrast stitching provides a tailored element for a touch of class, while plush backs, pillow arms, and pad-over-chaise seats ensure comfort from head to toe. A built in storage console completes the sectional, promising space to store snacks and drinks with two cup holders and a storage compartment.